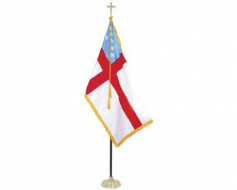 Lightweight polyester Episcopal flag mounted on a stick. 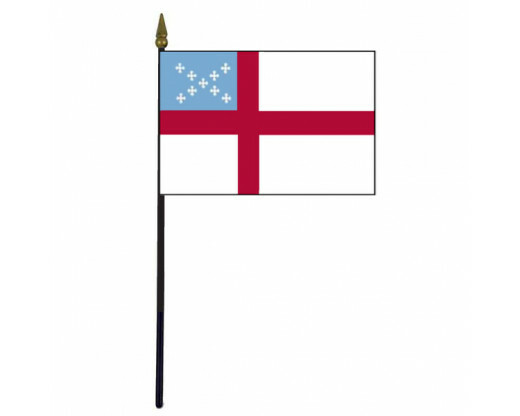 The Episcopal Church was founded in 1789 as a separate group from the mother Church of England, from which the churches in the colonies were separated by the American Revolution. The red white and blue colors are the colors of the American flag. 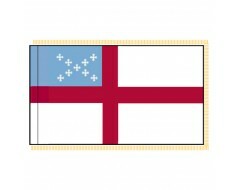 Many of the founders of this nation, including George Washington, were Episcopalians. The white field with a red cross is the cross of St. George, the patron saint of the Church of England (and incidentally the colony of Georgia). 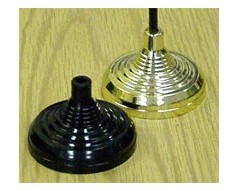 This remembers the Episcopal Church's roots in the Church of England. There are nine miniature crosses on the field of blue symbolizing the nine dioceses that met in Philadelphia in 1789 to ratify the initial constitution of the Protestant Episcopal Church in the United States of America. The crosslets are formed as a x-shaped cross of St. Andrew, the patron saint of Scotland. This remembers the Scottish Episcopal Church's important role in our history as it was their bishops who ordained Samuel Seabury as the first American Bishop in 1784. The colors each have a symbolic meaning: Red is for the blood Christ shed for us and for the lives of the martyrs of our faith; White is the color of purity; Blue is the traditional color of the Virgin Mary, the mother of the Son of Man.